Three civilians who tried to flee a rebel-controlled area of Aleppo via a humanitarian corridor were captured and executed, the Russian Ministry of Defense said, adding that Al-Nusra and Islamic State (IS, formerly ISIS/ISIL) terrorists in the area are trying to break free of the army’s siege. Moscow and Damascus launched a large-scale humanitarian operation in Aleppo last week, opening three escape routes for civilians and one for militants wishing to lay down arms. On Friday, the Russian Center for Reconciliation in Syria reported that militants captured at least three civilians as they tried entering the government-controlled territory from the rebel-held area. “Three civilians who today were trying to flee Karm al-Qasr quarter [of Allepo] to relatives who live in the territory controlled by the Syrian authorities, were captured and executed by militants,” the ministry said in their daily report. The statement also noted that over the past 24 hours, not a single civilian had been able to leave the eastern and southern districts of Aleppo. “Terrorists are obstructing the movement of people along humanitarian corridors. All approaches to these are being mined and are shelled with artillery,” the statement reads. Meanwhile, Russia announced that it delivered some eight tons of humanitarian aid to Aleppo. 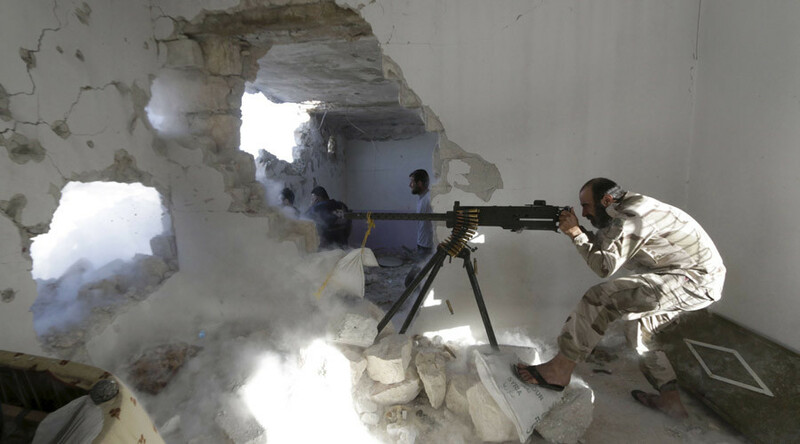 Jabhat al Nusra and IS fighters continue to disrupt peace effort and carry on their attacks on government-controlled neighborhoods of Aleppo using makeshift artillery and mortars. Intense fighting continues as terrorists try to break the government siege of rebel-held areas after the army cut them off last month. On Friday, Syria’s official SANA News reported that the armed forces managed to contain the wide-scale attacks carried out by terrorist groups operating to the south and southwest of Aleppo. At least three vehicles rigged with explosives, six tanks, and a number of vehicles equipped with artillery and machine guns were destroyed by the Syrian army. In addition, more than 300 militants were killed. Also on Friday, the Syrian Air Force launched 23 air strikes on “gatherings, sites and vehicle convoys of terrorists” in the Aleppo countryside, killing tens of terrorists and destroying their hardware.